1/2 cup dried nettles or 8 nettle tea bags removed from tea pouch. Rough chop up all veg. Heat olive oil in a soup pot. Add onion and cook until translucent. Add in celery, carrots, garlic and shiitake and cook for another 5 min. Add in all remaining ingredients and fill with 4 liters of water. Bring to a boil, turn heat down to simmer for 3 hours. 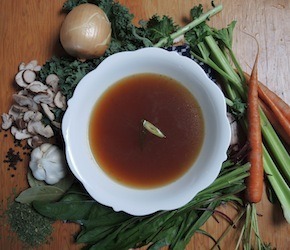 For a stronger broth, once simmered cover and let steep overnight. Run stock through a sieve/strainer for a clear broth. Pour into your favourite mug and enjoy! Stores in refrigerator for up to 3 days.